Our goal was to bowhunt caribou at river crossings, and film each shot. I wanted Bill to get the first caribou since he had never experienced this before. I will be filming him, then we'll switch off and I'll be the shooter. For my bow I will be using a 64# Black Widow TSA-X, Carbon arrows and a Wensel Woodsman head. Bill is using a 62# Assenheimer recurve, carbon arrows and Muzzy 125 heads. Seventeen years ago I had swore off Quebec-Lab caribou. Not because of the hunting, or hit-or-miss nature that is caribou hunting, but because I had never seen such chaos - logistically. 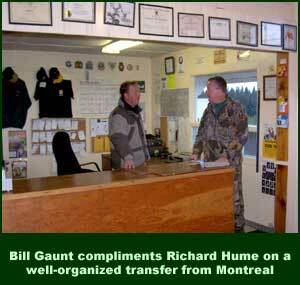 But it was comments (on the Bowsite.com Caribou forum) which changed my mind and prompted me to contact Richard Hume of Jack Hume Adventures (JHA). There was so much positive discussion about JHA that I felt perhaps it was time to give Q/L caribou another try. 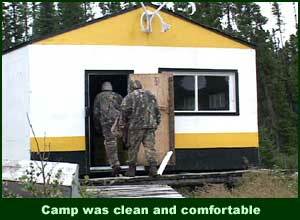 As with any camp, the dynamics between the hunters can be positive or negative. My '87 trip was an example of how personalities can clash and turn a hunt sour: a fellow in that group kept waking up another hunter in an attempt to get him to stop snoring. They darn near came to blows at 3:00 AM. So it's only natural that this time around I was concerned - I'm sure they were too. But after spending the morning with this great group of guys - there was no doubt we'd get along just fine. These were well-educated family men with a great sense of humor. We liked them immediately. After waving goodbye to the pilot and meeting Jimmy (one of JHA's guides) we organized our gear and headed out in pairs to three different areas of Wayne's Lake. Bill and I were last to leave but before long were on the water and heading to the East end of the lake. On the way out Jimmy pointed and said "bulls." 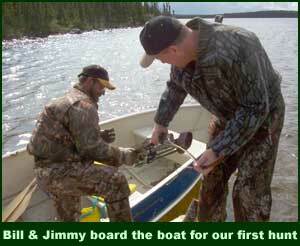 We motored 50 yards from 3 swimming caribou, including one real nice bull with double shovels and good backpoints. We continued on until we were at the end of the lake. It was a long, narrow finger which formed the perfect caribou crossing. A series of converging trails was where we decided to look for an ambush spot. While checking trails, I caught a glimpse of a bull moving above us. Things were looking good already. Jimmy headed back while Bill and I scouted for the perfect spot. We thought we found it and set up for the shot and the video. But the action was light. We saw a few cows and calves but no bulls. As the afternoon progressed, we moved a little further into the woods. Before long we caught a glimpse of a 'shooter' bull walking toward us. Bill and I got in position. As the tell-tale 'click' of the bull's hooves got louder, Bill and I readied for the shot. But the bull switched trails and moved out of sight. 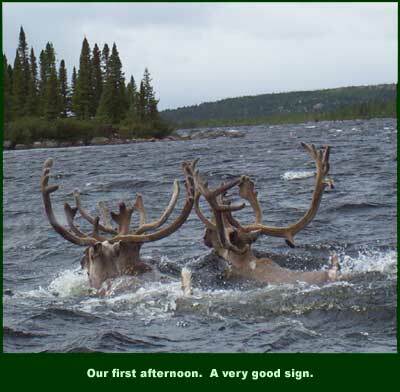 We saw a few more caribou swimming the lake but no more 'shooter' bulls. This was expected. Richard told us back in Schefferville that the first couple days would likely be slow. They were tracking the herd which should be building in this area and moving southeast - toward our camp. Tomorrow should be better. This was a special trip for me. It was seventeen years ago that I had graduated college and booked my first hunting adventure. My choice? Quebec-lab caribou out of Schefferville. While I successfully killed a nice bull on that trip in 1987, everything else about that trip was a disaster. This included the logistics from Montreal, getting to and from the field, even the security of my gear in transit (my camera gear was stolen). I was not hunting with Jack Hume on that trip. It was another outfitter who is still in business - but will remain nameless. 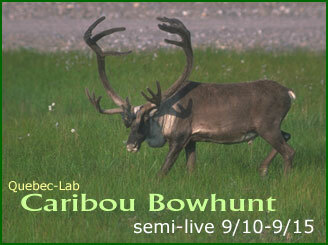 I had heard enough horror stories in the years which followed for me to swear off Quebec-Lab caribou - until this year. Fast Forward to 2004 and here I was at one of Jack Hume's outpost camps. The logistics, organization, and convenience getting here was outstanding. Bill and I checked in at the VNQ trailer at the Montreal Holiday Inn. Our stuff was weighed and we were given a time to board the bus for airport. 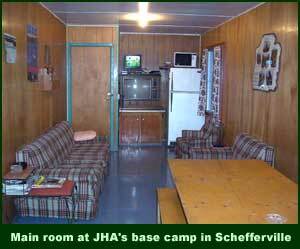 Upon our arrival in Schefferville, our gear was waiting for us in a Jack Hume bus. All we needed to do was climb in the bus and head to their office. At the office, our paperwork was laid out for us to quickly complete and we were handed a JHA hat, box tags and a pen. 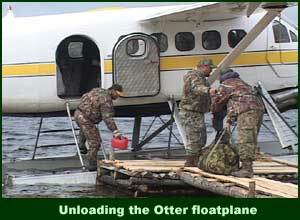 Once that was complete we were brought for supper in Schefferville and relaxed until our flight into the bush. I was very impressed with the organization provided by JHA and could clearly see that things have improved greatly since those disorganized days in the '80s.